Microsoft Outlook's Favorite Folders pane is a handy shortcut to frequently used folders. If you don't want Microsoft Outlook's Favorite Folders your options are limited. And as you'll see in a moment, I never, ever, deal with those icons again. You can remove each item one at a time so as to make it as small as possible (right click on the item and select "Remove from Favorite Folders", but you can't get rid of the Favorite Folders section. Annoying. But Favorite Folders are shown only when you're looking at "Mail" - in other words when the Mail icon at the bottom of that pane is selected. And I leave Folder List selected, always. Now, the reason I'm ok with this is that "Folder View" is very similar to the plain old "Mail" view. The only differences, besides there not being any Favorites, is that your Calendar, Journal, Notes and Contacts all appear as folders within that same view. Yes, they take up a little real estate, but it's much less than the Folder View area. But I still have favorites. And this would be the "hacky" part of my solution. They show up right at the top, I control what goes in there, and perhaps more importantly, they don't take up valuable screen real estate - I can scroll in that pane, and they scroll off the top. So whether or not you want to play with setting up your own favorite folders equivalent, my recommendation is simply to switch to Folder View. It's not perfect, but it is better. And here's hoping that the next version of Outlook allows us a little more control over what we see. Ask Leo! - How can I get Outlook 2003 to default the reading pane off, and to stop grouping? Ask Leo! - Why does Outlook ask me "Do you want to save changes?" If you want to know what happens in the next version of Outlook, then download the beta and install it to a test machine. I'm sure you are aware that Microsoft have made the Office 2007 beta publicly available for anyone to download, so try and - and answer your question in this artice. I have been running Office 2007 Beta 2 for several weeks now and they have not addressed this so far. I too find it confusing for my users and have tried to disable it. You can also right click on the shortcuts --> choose Navigation Pane Options and uncheck all of the shortcuts you don't want, including all of them. Unchecking all of them does not free up this real estate, but minimize this space as Leo mentions in the article and you should be good to go. This also allows you to reorder the icons if you don't like the order they are in. How do you restore the favorites folder..specificallly the 'unread mail' folder? Gordon, in Mail view, scroll down to the bottom of the list where you'll find "Search Folders". The 'Unread Mail' search is in here, just drag it up to the Favorites folder. p.s. You have "hear" instead of "near" in the "Use the Google search box" item of the "Before commenting" section below the Comments: box. Gordon, How do you restore the favorites folder..specificallly the 'unread mail' folder? I can't seem to find the Unread Mails folder in the Search Folder either. i want to remove the Search Folder. I followed the /cleanfinders switch but when i restart Outlook, Search Folders are still there. They may be Inactive but they still affect my Outlook. My issue why i want Search Folder to be DISABLED is its affecting my typing. When i type my mail, it takes 5 seconds or longer for the text to appear. But if i delete the 3 Search Folders, my typing is restored. Obviously, the indexing of the Search Folders slows down outlook. Is there a way to permanently DISABLE Search Folder in MS Outlook? Go to the bottom left pane where the icons are, click on the pane bar to expand or make it wider so that you can see all of your icons. Then click on Folder List and your favorites should go away. I have found a way to do away with the Favorites Pane if anyone is interested. 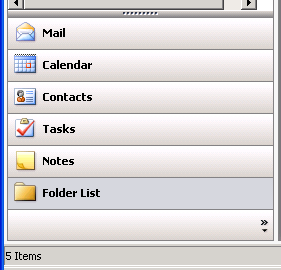 Click on the toolbar, usually the one with Outlook Today Icon, Back, Reading Pane Icon, etc., and then Customize. Choose the Web Toolbar to customize, add the Folder List Button to that toolbar mentioned above. When I click that icon off/on the Favorites Pane disappears. 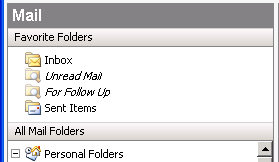 Then to get it back I go the GO menu in the main menus at the top of Outlook and then choose Mail. The favorites pane reappears, so there's choice. Anyone find this works? Works for me. Drag up the lists on your left pane of outlook and click on Folder List .You wont be able to see the favourite folder anymore . I was trying to find out how to show the Favorites Folder in Outlook and had to work backwards to find the answer. Why don't you post an answer for how to "Show Favorite Folder" when it's missing? Leo, how do you restore the favorites folder..specificallly the 'unread mail' folder? I can't seem to find the Unread Mail folder in the Search Folder. That was totally useful. I've been trying to work out how to do this all day. Thanks a bunch. The problem I have is that I lose more space looking at folders than I do seeing favorites in the email. In the email view, I don't see the following foders: Calendar, Contacts, Tasks, Journal, etc. By adding all of those in the listing, I'm losing much more space than I'm gaining... Any other ideas out there? Go to the View menu and select Navigation Pane. It has an option to turn favorites off. (If the option isn't there, click on the "mail" icon first.) Thanks for this information, Leo. I lost the favorites folder and was looking for it. MS Help was useless. It didn't tell me the option wouldn't appear if you hadn't selected the Mail icon. Somehow a calendar ended up in my Favorite Folders pane in MS Outlook 2003. How do I remove it? Right-clicking only shows option to remove entire calendar from Outlook; not an option I would like to see happen. Go to Go > put a check mark beside "Folder List"
I am using Microsoft OUtlook 2007 and I use the Favourite Folders pane which I have been happy with. However, recently, I have wanted to remove folders from the favourite folder pane (although I do not want to delete them entirely). I right click the said folders and choose 'remove from favourite folders' and they are gone. HOWEVER, when I start outlook again, the removed folders are BACK!!!!! Thanks for the reminder Leo!! I have to do this every time I install Office2003 or everytime MS decides to interfere with my settings. I always forget that I just need to select Folder List and deselct the rest. I use a big tree with heaps of folders and subfolders, so I need the folder tree to nagivate, but nothing else. Much appreciated!! Ok, I hope someone checks this. Where did it, my calendar, go??? I click on calendar and it asks to open a shared calendar... I don't share calendars... never have. I used to be able to click between the mail icon and the calendar icon at the bottom of the folders list, with no problems... now everything is messed up. please help me find my calendar! 3) Click on the 'Folder List' icon in your 'Navigation Pane'. This removed my 'Favorites Folder'. While in "mail view" click the view ribbon > navigation pane > favorites option. All you have to do is delete all folders from the Favorites and then simply click the "Folder List" icon at the bottom left in Outlook and the Favorites folder is gone!! A lot simpler then what you described above. Thanks! Been looking for how to do this! Select "Mail" in the lower left corner. I cannot do any of the above. cannot find "mail" in the lower left corner, Navigation pane in View/folder list on the bottom. best way I could unblock what I really want to see was to make the whole thing larger (control +) and then I still see the favorites bar but I also see what was blocking my view.